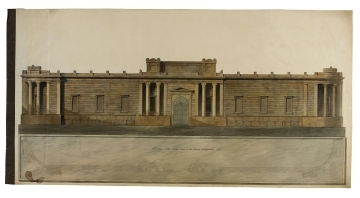 63 Elevation 64 Plan and Elevation of the North front of the Bank of England. 1802. Drawings 63 and 64 show the screen wall with blind windows. These windows were added to the elevation when the screen wall was extended westward in 1803.